The text of this post is taken from Vandana Shiva’s book “Monocultures of the mind”, but I’ve rearranged and simplified the text so it’s more like a remix than a straight quotation (and therefore any errors are my fault, not hers). The images were created using Inkscape. 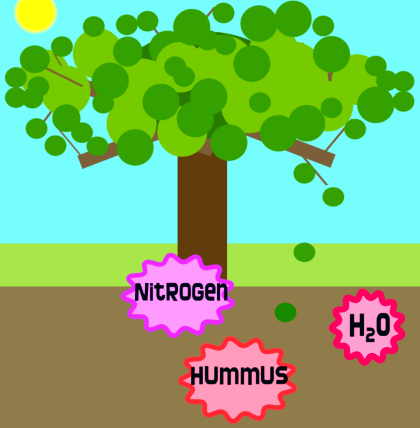 The bar graph image is a mash-up which includes the Public Domain image ‘Tree icon’ by Hashim Al-Attas. When the West colonized Asia, it brought with it ideas of nature and culture derived from the industrial factory. 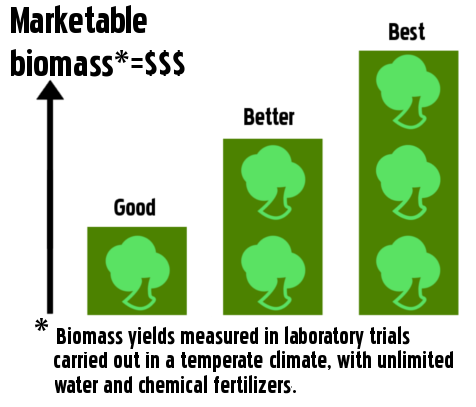 Commercial forestry looks only for the industrially useful species that can be profitably marketed, and measures productivity in terms of industrial and commercial biomass alone. As the paper and pulp industry rose in prominence, the hybrid eucalyptus, which was good for pulping, came to be the preferred species. Natural forests were clear-felled and replaced by monocultures of the exotic eucalyptus. Industrialists, foresters and bureaucrats loved the eucalyptus because it grows straight up. 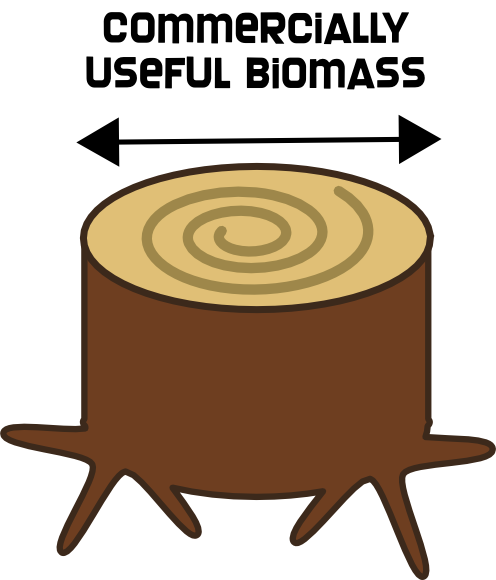 The straight, uniform trunks are ideal for industrial use, and little precious biomass is “wasted” on small branches which cannot be converted to pulp. The experts decided that indigenous knowledge was worthless and “unscientific”, but nothing could be further from the truth. Ethnobotanical work among India’s many diverse tribes is discovering deep, systematic knowledge of the forests. For example a study conducted among the Soliga shows that they use 27 different varieties of leafy vegetable at different times of the year, and a variety of tubers, leaves, fruits and roots are used for their medicinal properties. A young, illiterate Irula boy identified 37 different varieties of plants, gave their Irula names and their different uses. Decentralized agroforestry is India’s age-old strategy for maintaining farm productivity in arid and semi-arid zones. The honge, tamarind, jackfruit and mango, the jola, gobli, kagli and bamboo traditionally provided food and fodder, medicine, fertilizer and pesticide, fuel and small timber. The backyard of each rural home was a nursery, and each peasant a silviculturalist. The honge could be nature’s idea of the perfect tree for an arid region like Karnataka. It has rapid growth of leaves and small branches – precisely those parts of the tree which go back to the Earth, enriching it and protecting it, conserving its moisture and fertility. Its profuse branches and dense canopy provide shade to shelter the soil and the nearby plants, lowering the temperature in the immediate vicinity and reducing water evaporation from the soil. But experts decided that indigenous knowledge was worthless and “unscientific”, and proceeded to destroy the diversity of indigenous species by replacing them with row after row of eucalyptus seedlings in polythene bags. It destroyed the water cycle in arid regions due to its high water demand and its failure to produce humus, which is nature’s mechanism for conserving water. Nature’s locally available seeds were laid waste; people’s locally available knowledge and energies were laid waste. With imported seeds and expertise came the import of loans and debt and the export of wood, soils and people. Trees that had been a living resource, maintaining the life of the soil and water and of local people, were replaced by trees whose dead wood went straight to a pulp factory hundreds of miles away. Local work disappeared and was replaced by work for brokers and middlemen working on behalf of industry. It is the indigenous people, and not the experts from the government, the forestry industry and the World Trade organisation, who have the more sophisticated and useful knowledge system. Indigenous knowledge systems measure the productivity of trees as a sum of all the goods and services they provide, including conserving water and building soils. It is little wonder that Garhwal women call the tree “dali” or branch, because they see the productivity of the tree in terms of its non-woody biomass which functions critically in hydrological and nutrient cycles within the forest, and through green fertilizer and fodder in cropland. What’s behind the secret door?